How can we communicate global warming to local audiences (= everybody who lives in a place)? 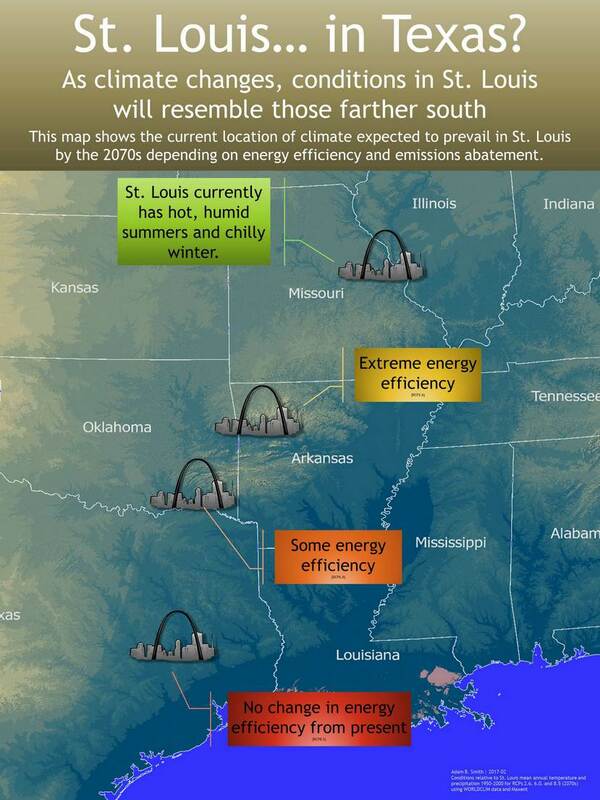 Recently I made a poster showing the locations that climatically currently resemble the future climate of St. Louis. But how did I know where to locate the “future” St. Louis climatically? By running species distribution models in “reverse”. First, I created a set of 100 points to represent St. Louis (I actually had them have the exact same coordinates–it’s false sample size inflation, but it doesn’t matter much since at first approximation St. Louis is a point–and it does allow me to use more complex fitting features in Maxent). Second, I associated these points with the climate layers I have for the 2070s (once for each emissions scenario). I then trained a Maxent model using this future climate data, then projected it back to the present. Finally, I calculated the geographic center of gravity of all cells using the predicted suitability as weights. 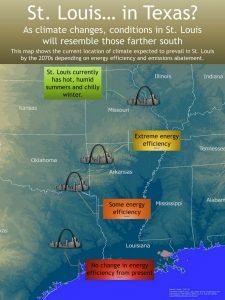 The center gravity is the average location of the “future” climate of St. Louis! I found I got slightly better (= intuitive) results by thresholding first, then using suitability values above the threshold as weights. I also found I got better results when using only mean annual temperature and precipitation, rather than all 19 WORLCLIM variables. This procedure is fairly simple and takes advantage of the fact that 1) “species” distribution models are not just for species, and 2) the output of a SDM (or whatever you want to call them) is really just an index of similarity of a multivariate space (= climate layers) at a set of points (= presences) and another set of points (= all grid cells in the layer to which you’re projecting). I’ll be trying the poster out at the Missouri Botanical Garden’s upcoming Science Open House–hopefully it will spark some conversation!